Dan Wilson ran for 203 yards and 5 touchdowns to lead the Leopards past the visiting Wildcats 48-14 back on October 7, 1994. Mark Rich also caught a touchdown & Jason Siegfried ran for another. 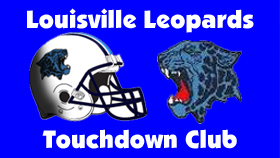 Jason Siegfried had a pick six as 1 of the Leopards 4 takeaways on defense and Dan Wilson had 206 all-purpose yards & 3 touchdowns as Louisville blanked Ravenna 35-0 back on September 9, 1994. Louisville rallied from a double digit deficit, but Minerva recovered a fumble in overtime to take the contest 26-20 back on November 3, 1995. Louisville scored the final two touchdowns to pull ahead and take a 38-21 win at Minerva on November 1, 1996. Leif Erickson ran for 126 yards & a touchdown to lead the Leopards. The Leopards defense forced six turnovers en rout to defeating the West Branch Warriors 18-13 on October 25, 1996. Leif Erickson provided the game-winning fourth quarter touchdown. Anthony Buccasso & Leif Erickson each had touchdown runs to lead the Leopards over the Vikings 14-11 back on September 1, 1995. The win was Louisville’s 5th straight over Hoover. In one the purist games in Louisville Football history, the Leopards defeated the Springfield Spartans on Brian Parker’s 29-yard 4th Quarter Field Goal 3-0, while Brian Ramsey & Kaloni Bell made key plays defensively.